Volcanic ash and associated aerosol layers in glacier ice offer a uniquely complete record of explosive volcanism. Investigation of these layers, both in bare ice areas of and in ice cores offers insight into eruptive processes, local and regional ice flow processes, and the impact of eruptions on global systems (climate and ozone depletion). 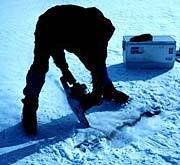 The Antarctic ice sheet is an ideal place to preserve a record of volcanic eruptions. The combination of chemical fingerprinting of glass shards, and chemical analysis of volcanic aerosols associated with tephra layers in Antarctic blue ice allows establishment of a high-resolution chronology of local and distant volcanism that can help understand patterns of significant explosive volcanism, atmospheric loading, and climatic effects associated with volcanic eruptions. Correlation of individual tephra layers, or sets of layers, in blue ice areas, which have been identified in many places along the Transantarctic Mountains, will allow the geometry of ice flow in these areas to be better understood. Finally, identifiable tephra layers in the Siple Dome Project ice core will be compared with a detailed well-dated and characterized record of volcanism in Marie Byrd Land in order to provide unique time-stratigraphic markers in the ice core record. Kyle, P.R., Dunbar, N.W., McIntosh, W.C., and Esser, R.P., 1995. The potential and application of tephrochronology in Antarctic blue ice areas. Volcanoes in the Quaternary Abstract Volume, Quaternary Research Association and Volcanic Studies Group Joint Meeting, Geological Society of London, 3-4 May, 1995.